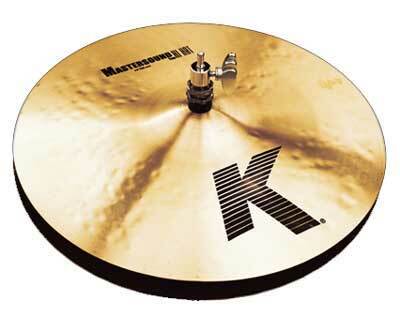 Shop Zildjian K Mastersound HiHat Cymbals from AMS with 0% Interest Payment Plans and Free Shipping. Zildjian Cymbals K Series Models: A Sound that's Always in Style. Legend. Legacy. The innovative cymbal work of Art Blakey, Elvin Jones, Tony Williams or any one of a sweeping collection of the greatest drummers in history. They’ve all been fueled by K Zildjian cymbals. The deep, dry and shimmering sounds developed by Kerope Zildjian in 19th Century Turkey continue to inspire drummers today. Elaborate hammering and lathing work our secret alloy into versatile cymbals with a wide-ranging blend of high and low frequencies that can be mellow or intense. It all depends on how you play them. Possessed of the same deep, dark, warm, low-pitched tonal characteristics associated with K Zildjians. But featuring the distinctive fast, clean Mastersound "chick". Zildjian Cymbals Cast Bronze Models - A Labor of Love. Each Zildjian Cast Bronze cymbal is individually cast from the secret Zildjian alloy formulated over 380 years ago. Using finishing processes refined over centuries, craftsmen create the distinguished cymbals played by the world’s greatest drummers and percussionists - including you. The deep, dry and shimmering sounds developed by Kerope Zildjian in 19th Century Turkey continue to inspire drummers today. Elaborate hammering and lathing work our secret alloy into versatile cymbals with a wide-ranging blend of high and low frequencies that can be mellow or intense. Hammered groves in the bottom cymbal of these HiHat pairs rapidly vent trapped air for a fast, clean and clear "chick" sound.